Stop those bots that RT your tweets! You’re busy finding and entering twitter competitions, putting in the effort and trying to win yourself some goodies. You notice a notification and find an odd looking retweet. The retweet quotes your competition entry tweet but with some of the words missing. You’ve just been retweeted by a competition bot. A US coder was boasting about his wins from writing such bots. Needless to say he didn’t make many friends, but he does seem to have inspired other coders to try and copy his success. So, how do you do your bit to stop these bots from retweeting you and entering the comps? You block them. It means that they can’t see your tweets or interact with them. 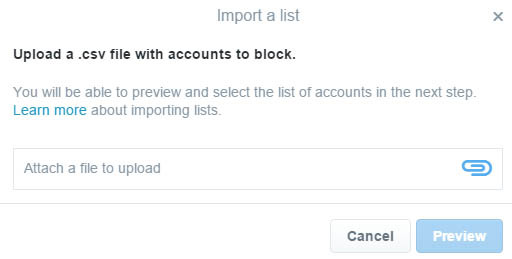 Twitter has recently allowed users to import lists of accounts to block. This is a handy tool. By putting together a list of identified bots, we can import this list and make it much more difficult for the bots to win. 1. Download > this file <. Please don’t link to this file. It will be updated regularly and the name will change. 2. Log into your twitter account and go to > this page <. It doesn’t look like you can currently import lists on a mobile device. It seems that it can only be done using a laptop / PC. 3. Click on the Advanced Options drop down and select ‘Import a list’. 4. In the pop-up window that appears, click on ‘Attach a file to upload’. Select the file that you downloaded in Step 1. Then click preview. 5. A list of the bot accounts will be imported. Once you’re satisfied you want to block them, click ‘Block’. That’s it. You’ve just blocked a bunch of comp bots. This means genuine compers just had their chances of winning increased by a little bit! File last updated 18 January 2017. Thanks was getting fed up with these accounts! Thank you so much, fabulous work! Wow, thank you so much for this and for linking it on Facebook. I’ve noticed quite a few accounts who have entered giveaways I was doing myself. All blocked now. Thanks again! I’d like to share this with my fellow parent bloggers via my Facebook page and Twitter account if that’s ok? (BattleMum handle). Hey… so, as a bot writer (long before US guy hit the press), all I can say is, you’re kinda helping us by blocking us. Blocking is mutually beneficial for both the bot writer & the comper. The phenomenal demand for this ‘block list’ is such that it’s obvious how much people detest Competition Bots. If being on this list is so helpful, Sarah E, why are you being so coy about sharing your bot accounts? Thanks Grant – that’s very useful. Lots of cheating bots blocked! thank you so much; do you update the list and do we need to do this again? Fantastic! Thanks so much for this. I’m rid of 138 woooohoooo!! Late Nights on Holiday for Kids? Bad Idea!